The Destiny 2 community is hyped up again thanks to yesterday's This Week at Bungie blog update. The game's upcoming 1.2.3 update on July 17 will add a bunch of new features, so it's time to make sure your Guardian is well-equipped to take on what's in store. That's where Xur, Agent of the Nine comes in. He's back this weekend with another selection of Exotics for you to peruse and purchase, if you have the Legendary Marks for them. 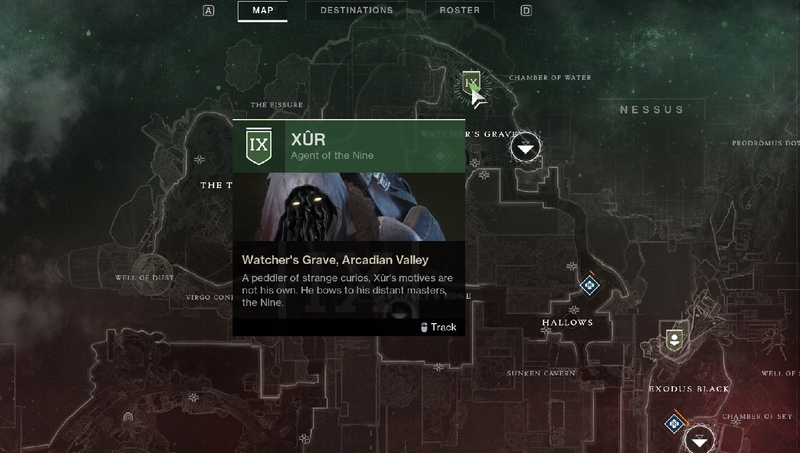 Xur is on Nessus, the site of this week's Flashpoint, in the Watcher's Grave section of the map to the north. He's standing on the branch of a massive tree. This week's weapon is The Wardcliff Coil, an awesome rocket launcher. This weapon shoots a long volley of Arc rockets that deal a massive amount of damage. It also has a perk that lets you automatically reload the weapon upon picking up Power ammo. It costs 29 Legendary Shards. For armors, the star of the show this week is Ophidian Aspect, which are Warlock gauntlets. These gauntlets make weapons ready and reload very quickly, while simultaneously extending melee range. They are probably the best all-around Warlock Exotic armor in the game. They're on sale for 23 Legendary Shards. For Titans, Xur has brought an Insurmountable Skullfort. This helmet enables kills with Arc melee abilities to trigger health regeneration and restore melee energy. It's a classic from Destiny 1, and it costs 23 Legendary Shards. This weekend's Hunter armor is Lucky Rapsberry, a chest piece. This armor increases the chaining capabilities of Arc Bolt grenades and has a change to recharge grenade energy each time it deals damage. It also costs 23 Legendary Shards. 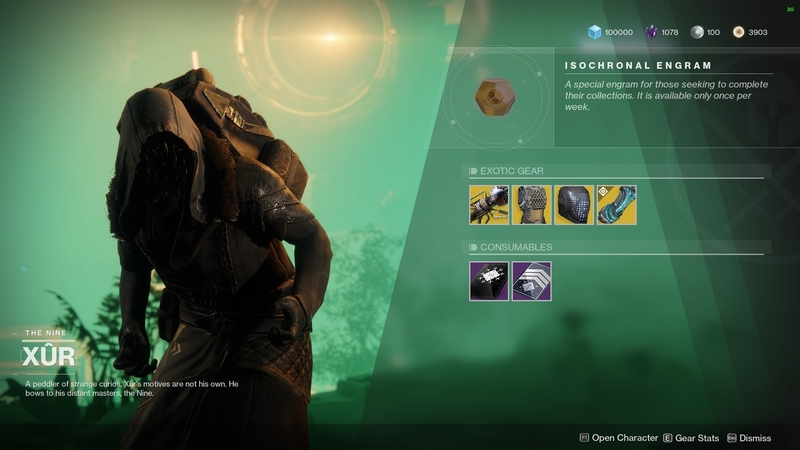 With Destiny 2 on the rise and awesome content on the way, make sure to visit Xur and pick up these armors and weapons, all of which have a place in multiple playstyles.